The Olympic Ideal is alive and well. Whether or not any of the original ideals still cling to the expensive and overbearing presence due in London next summer is certainly open to debate, but the ideal has been replicated across the world in many smaller contexts. The best known alternative games here is the Commonwealth games, and I believe French speakers have an equivalent in the Francophone games. The format is popular in Asia, with the Asian games provided a continent wide tournament, and others such as the South East Asian Games providing a more local competition for fewer nations. Even at national level, the provinces of Indonesia come together for their own national games. But you do not have to be nations to compete. The concept is open to any group to combine together for competition and friendship, with a linked theme connecting the various competing groups. The concept of Island Games therefore would not be a surprise in areas where many Islands. And so we have such combinations at the Central American and Caribbean games, and the South Pacific Games. The latter includes a football competition that was used as part of the qualification procedure for the 2010 World Cup. It was intended that this year’s South Pacific Games would again be part of the World Cup qualifying competition, until it fell foul of FIFA regulations. While it was alright to have places not affiliated to FIFA playing in a competition that formed part of the World Cup, as happened with Tuvalu (their games were simply ignored by FIFA), it is not acceptable to have a FIFA member of the Asian Football Confederation (Guam), playing in Oceania qualifying. Even though Guam are one of only four FIFA members who have not entered for the 2014 World Cup, FIFA are not prepared to simply ignore their results. One has to wonder though about the International Island Games Association though, simply as it does not specify any geographical limitation. One should not wonder though, as this is in fact one of the most successful games around. Commencing in 1985, the Island games have been run every two years, and regular increased in size. The initial games involved 15 islands, and some 700 competitors. In fact the games, which were started in the Isle of Man, have always been dominated by islands with some connection to Britain. The fifteen included the Isles of Man and Wight, Shetland and the Orkneys, Guernsey, Jersey and Ynys Mon. The other mainstays were Scandinavians, Froya, Hitra, Gotland, Åland, Iceland and the Faroe Islands. Two came in from further afield, the mid-Atlantic British territory of St. Helena, and the Mediterranean Island of Malta. Only Iceland and Malta have not remained as members, both leaving after 1997 and both now giving their attention to the European Small Countries Games (the smallest nine countries in Europe). Flying the Flag  the Red and White of Greenland. The Island games added three more of the British in 1987, Alderney, Sark and Gibraltar, (the only member of the Island games which is not an Island). In 1989, Greenland joined  Greenland has similar status to the Faroe as an autonomous Danish territory, although they timed an application to FIFA at the wrong time, and won’t be trying for the World Cup any time soon. 1991 saw two more join, the Canadian Island Province of Prince Edward Island, (who have now resigned due to lack of funding), and the Estonian Island of Saaremaa. In 1993, the games reached the South Atlantic with the Falklands joining, and the next additions also added to the scope, the Cayman Islands and Rhodes in 1999, followed by Bermuda in 2003. In 2005, one more British Island group, the Western Isles joined, while the most recent member (2007) is Menorca from the Balearics. So the organisation is dominated by the British, with 15 members being connected to Britain. These are five overseas territories, (Bermuda, Falklands Islands, Cayman Islands, St Helena and Gibraltar), five crown dependencies, (Alderney, Sark, Guernsey, Isle of Man and Jersey) and five which are parts of the British Isles, (Isle of Wight, Western Isles, Shetlands, Orkney and Ynys Mon). With the exceptions of the two Mediterranean islands, all the rest are Scandinavian. In terms of population, the Islands vary from just 600 on Alderney, to 140,000 on the Isle of Wight. I took a brief look at the association rules, and they recommend that any new members should not exceed 125,000 in population, and must be true Islands (i.e. no more like Gibraltar). They also say a maximum of 25 members. I am not certain that maximum is strict, but the games cannot easily expand more. Around 4000 people are on the Isle of Wight for the games, (3500 contestants, plus officials, and supporters). At least half the Islands are not potential hosts as they could not cope with this influx, and an increase in the number of islands would reduce further the potential to rotate the tournament. It is worth considering the number 4000 people for the games, widely publicised, and the official count of athletes which sat just short of 3500. The last winter Olympic games brought just 2566 competitors to Vancouver. So far there have been 14 editions of the Island games, with 10 of the Islands having taken their turn to be hosts. In 2013, Bermuda will be the 11th, while Jersey have their second games confirmed for 2015, and it is expected that Gotland will again be hosts in 2017. The games covers 15 sports from Archery to Windsurfing, but with around 500 of the competitors in 25 teams (15 men’s, 10 women’s) football is the biggest of the sports here. For the record, three of the members of the Island games association members are also members of FIFA, although none of the three are countries in their own right. Bermuda and the Cayman Islands both send their own teams to the Olympics, while the Faroe Island’s international recognition is limited to FIFA. Nine different football grounds were in use, as the games spread across the island. The Isle of Wight is home to four members of the Wessex League, steps five and six in the English pyramid, which means the grounds are enclosed, with some covered accommodation and floodlights. The rest are used for Island League matches. Most of these are somewhat more open, with the pitches merely roped off, rather than a permanent rail. The ground at Oakfield was exceptionally tight, with just a small bank on one side for most of the spectators. The one thing that all the grounds selected do appear to have in common is a good club house. In most of the sports of the games, the spectators consist of friends, family, a few competitors watching on their free time, and maybe the occasional local. There were two casual “supporters”, one from the Isle of Man, the other from the Falklands who were staying at the same B&B as me, but both were former officials with their teams. The one sport that attracted a significant outside crowd was football. There were a good number of groundhoppers who made the trip from various parts of England, who while being interested in the football, were also trying to maximise the number of grounds visited on the trip. I would also hazard a guess the locals were more prominent in watching the football than most of the other sports, with the home team naturally attracting more locals than other teams. I could not justify a full week off work for the trip, although after three days on the Island, I was regretting this. I instead chose to stay for three days starting on the Sunday, (the opening day for football). The plan was for seven games, four on Island league grounds which would be new to me, and three on Wessex League grounds not visited for over 25 years. The only two grounds that I did not visit had both been on my itinerary when the games were held on the Isle of Wight in 1993, and a day trip allowed me to go to West Wight, East Cowes and Ventnor. As it turned out, I added an eighth game to my list, the only one to be played on the Monday morning, and for me a rare viewing of the ladies game. I had to leave home for the trip around 8 in the morning, but this allowed my drive down to Southampton to be comfortable, arriving over 30 minutes before the 11 O’clock Red Funnel ferry. This drops one at East Cowes around an hour later, and I easily had time to check into my Bed & Breakfast (in Shanklin) and then drive back up to Brading for a 3 O’Clock start. Admission for the game, (individually for all games) was set at £3, but I was fortunate in being able to obtain a season ticket for £20. A small saving over an eight game trip. Brading is a neat and tidy ground, that has added a small stand and floodlights since my earlier visit. At the entrance, I obtained a tournament brochure (£3) and a matchday programme (20p). The latter contained the names and squad numbers for the two teams involved, and was printed on green card folded over to four pages, A5 size. The squad numbers turned out to be generally accurate at all the games I saw, except this first one. The game was Rhodes against Greenland, and provided an entertaining start to the trip, with a sting in its tail. It was played in very hot sunshine, the highest temperatures we were to enjoy on the trip. Much of the rest of the time, it was more traditional “Football Weather”, with us giving thanks not to get too much rain at those grounds without covered accommodation. Greenland played a very open and entertaining game, and had a fair support, most of which appeared to be their own Women’s team. They also came with a match commentator who had to watch from the clubhouse, about 30 yards behind the goal as this was the only place where he could get the connections allowing him to broadcast the details to his homeland. Still, the Greek side were too strong for Greenland, and spurning an early chance by missing a penalty, Rhodes were 1-0 at half time and increased the lead soon after the break. Greenland brought on their third substitute, Steve Broberg with seven minutes to play, and he scored within a minute of entering the play. This caused the Rhodes team some anxious moments, which were really not necessary, and were compounded by their own foul play. As injury time started, and with the ball as far away from their own goal was possible, a stupid but violent tackle earned a red card. This meant five minutes of injury time with ten players for Rhodes, but with this almost up, the goalkeeper, already booked for time wasting collected a ball just outside the penalty area and hence picked up his second card. Rhodes therefore finished with nine men, although they did take all the points. Greenland had a fair modicum of support at the game, even if most were from their other teams, such as the Ladies Football team, they also had a radio commentator, who had to watch from the clubhouse somewhat too far behind the goal, as it was the only place he could get a connection allowing him to broadcast direct to Greenland. The Channel Islands had a TV crew at the games, giving some delayed coverage on the following morning’s news. I did not notice much else in terms of media coverage. I travelled on to Cowes Sports, where the only stand was still there as a memory of my previous visit. Here the game was Jersey v Menorca, in the same group as the Rhodes v Greenland game. To be honest, this game was not as entertaining as the previous one, but it was of a higher general quality. All of these who had watched the pair seemed in agreement that the evening game would settle the group, and the other pair were liable to suffer two further defeats. As it was, Jersey who became stronger as the match went on, scored a goal in each half against their Spanish opponents. Despite the match being played in good spirits, we again had an injury time sending off, and it was a Menorca player who saw red. Up bright and early the next morning, I started my tour at Oakfield, which was to be the first of the Island League clubs I visited. Indeed, I was to go there twice, first for this Ladies game, (the only match being played on Monday Morning), and then the next day for a men’s game. The ground is in a residential (and slightly run down) part of Ryde, and is the tightest of the grounds, with most of the spectators settling on one side, where there is a slight grass bank. The spectators mixed somewhat with an overflow of players and officials on this side. Behind the goal were two buildings, a bar which incorporated a small area with tables, and a dressing room block which also provides a minimal covered area. The game was Jersey against Hitra. Hitra is a small island off the coast of Norway. 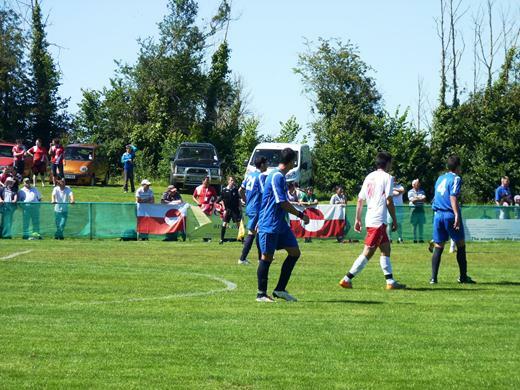 Both sides had played the day before, Hitra losing 3-0 to Isle of Wight, while Jersey had gone down 5-0 to Åland. I am not a great fan of Ladies’ football, and this was not a game to change my prejudices. It was just played at too slow a pace. Some of the Jersey ladies showed a little skill on the ball, but this was spoilt by a failure to master teamwork, or to support the player with the ball. Jersey’s Jodie Botterill frequently found herself alone up front, and uncertain what to do. Greater support would have resulted in the final score being much more than the six goals to one that Jersey eventually won by, and Botterill could well have done more than score a hat-trick. The biggest cheer of the day from a crowd that exceeded 100, must have been for the Hitra goal, a fine long distance effort. The third game of the day was at Rookley. Being the only game scheduled at this venue, it brought in a flood tide of groundhoppers who had varied their choice of games earlier in the day. It may have been thought of as an odd venue. The club here had picked up only one point from 20 Island League third division games in the season past, and ended with a goal difference of -202. Perhaps it was a reward for not giving up. It is a very pleasant set up, with a fine club house, and a lot of space around a roped off pitch. The Sun came out to great us again, after dull weather earlier in the day. Still, this was not the biggest game in the tournament. The Falkland Isles had already lost to Guernsey 5-0, while the Isle of Man would be clear favourites after a 4-2 win over Gotland. There was no doubt that the Manx would be looking for goals as well, as holding a goal difference advantage would clearly help them out when facing Guernsey in their third game. In the first half this was the way of things, with the Isle of Man starting the scoring on ten minutes, and reaching 5-0 by half time. The second half was somewhat different, and only one more was goal was added, just five minutes before the end. As it turned out, Guernsey were in the process of beating Gotland by 5-2, so the two were to go head to head level with the same goal difference and each having scored ten goals. I had met Steve Munday earlier in the day, and he was eager to persuade me to drive around some of the good beer guide pubs on the Island, while I preferred the idea of getting back to Shanklin before drinking much. Steve’s plans carried the evening, but driving back to Shanklin we attracted the notice of the local police. Fortunately, I had not over indulged, and comfortably passed the breathalyser test  but because the stop came within minutes of leaving the pub, we had to wait around for fifteen minutes before I could be tested, (this reduces the chance of a false positive). Fortunately, this did not prevent me from having a couple more pints in Shanklin, after the car was parked. Steve actually disappeared part way through this to try out another pub. Although what would happen if the Isle of Man’s game against Guernsey was a subject of conversation at the Tuesday morning game, it was not the only subject. I had already seen Rhodes having two players sent off at the end of their victory over Greenland. In defeat to Jersey, the story was worse and they had three more sent off (two in an elongated injury time period). Events after the game did not help matters, and another red card was reported as being shown after the final whistle. Rhodes have previous as well, famously having five men sent off in a game in a previous tournament. A disciplinary committee was quickly set up to look into the matter, and we soon heard that Rhodes were not only out of the football tournament this time, but would not be allowed into games football tournaments in 2013 and 2015. The only game on the Tuesday morning was at the Isle of Wight Community Centre, just a couple of hundred yards from the Cowes Sports ground. 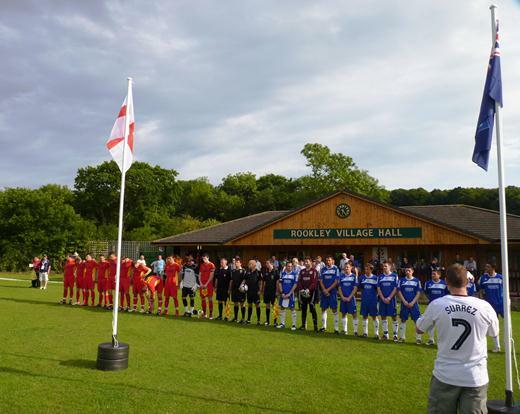 The venue was similar to Rookley, in having a large field, roped off pitch and a good clubhouse. Most teams in the games were playing three games in successive days, the sort of schedule that would have Premier League managers tearing their hair out. Not quite the attitude for these teams. Alderney and the Falklands were planning an extra game if they did not meet each other, with a special trophy, “The Small Islands Cup” available for the better of the two footballing Islands with the lowest population. The Tuesday morning was a little more relaxed, in so far as the two teams involved had only played once each in the only three team group. I had already seen the Western Isles lose 2-0 to Åland, so Saaremaa who drawn 3-3 with Åland in their first game knew that a better result would see them top the group. All the advantages should have been with the Estonian side, who of course had taken a day’s rest while the Western Isles were playing. While most sides in the tournament were made up of players from different clubs, and wore kits showing Island badges, Saaremaa wore the kit of FC Kuressaare  a first division side that plays on the Island. Their entire squad was made up of players from this club, although not all the first team regulars could play. The rules did not ban those from being with a professional club, but only those players either born on the Island, or who had passed the residency qualifications could play. One of the features of this was that the players’ shirts had names as well as numbers on their backs, but not every player was a member of the first team squad, and so the others had other players names on their backs. Still the game turned out similar to the Western Isles game the previous day, as they defended well, but showed little promise going forward. Scoreless at half time, Saaremaa scored early in the second period, but only hit a second with five minutes to play, ending up with the same record as their rivals. This was to be the highlight of the day, all four of the other teams I was to see would go into their games with two defeats each from their earlier games. First it was a rather hurried ride back to Oakfield to see the Falkland Islands again, this time against Gotland. Both may have lost twice, but there was never any chance this game would be close fought. The Falkland Isles were 3-0 down at half time, and 6-0 down on the hour mark. They pulled one back, and ended up on the wrong end of a 6-1 defeat. After this, I had plenty of time before the final game. With Steve again as passenger, we headed towards St Helens and Bembridge, for no other reason than I had been here on family holidays near enough forty years before. I remembered very little of the villages as I sat on the green and ate fish and chips. Steve, unsurprisingly was again checking out the good beer guide pubs. I do know we used to stay in static caravans, (we did not have a car, so we certainly could not tow one). It was good to hear similar accommodation was used by many of the games competitors. 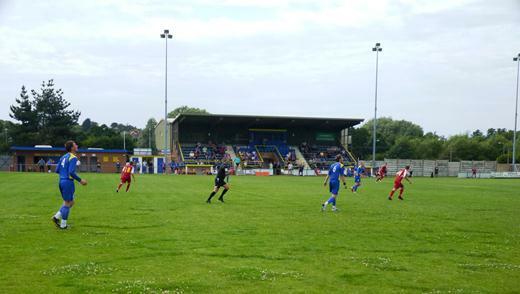 Then it was onto Shanklin  this was the best of the Island League grounds we visited, with low banking each side of the pitch. In the same way as there was no surprise when the Falklands had lost in the afternoon, it was also a straight forward victory as went down 5-0 to Ynys Mon, (the Welsh Island better known as Anglesey). And so ended my trip  a rushed drive across the Island meant I was on the Ferry around 45 minutes after the match finished, along with several other car loads of hoppers who had also rushed across from Shanklin. The tournament of course carried on. The Wednesday was a rest day, but there was still one feature  a penalty shoot out between Åland and Saaremaa, which decided that the Finnish side could play in the semi-finals. They were joined at this stage by Jersey, Guernsey and the hosts. The other sides with the exception of expelled Rhodes would play again in placing matches, The Falklands 3-1 win over Alderney have them 13th place overall and the “Small Islands Cup”. The other placings were Westen Isles 12th, Greenland 11th, Gotland 10th, Ynys Mon 9th, Isle of Man 8th, Menorca 7th, Saaremaa 6thand Gibraltar 5th. 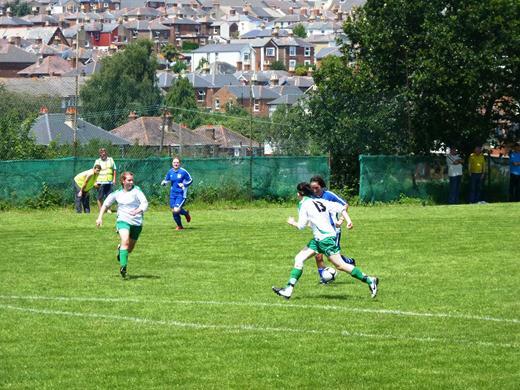 In the semi-finals, 816 saw the Isle of Wight beat Jersey, while Guernsey defeated Åland3-2. The following day, and the fifth game of the week for the final four. Jersey beat Åland by 5-1, and over 2000 saw the hosts win 4-2 over Guernsey to take the title. On the same day, Åland took the Women’s title with a 5-1 win over the Isle of Man, Greenland took the Bronze with a 1-0 win over the Western Isles. The official crowd figures, not finally published until two weeks after the event, showed a total of 11,000 spectators at the games. (Some of the figures must be taken with a pinch of salt, as with the majority of the spectators having passes, counting was a little loose  still, I think the total will not be far out). Most of the spectators did not pay on the day. There was a £20 football season ticket available, or a £25 games pass (which allowed the purchaser to use the bus services as well as enter any games event). All competitors also had a games pass, (indeed, a lot of the time, they were expected to use the local bus service to get from their accommodation to the venues). There were a few other items to report from the organisation of the games, such as the opening days games were started without National or Island anthems, they were not delivered to the grounds in time. The rest of the time they were played. Some of the groundhoppers that stayed until the Thursday were annoyed when the 7th/8th placing match was switched at short notice from 11.30 to 10.00 kick off, to allow the Manx players to go on to support their ladies team afterwards. 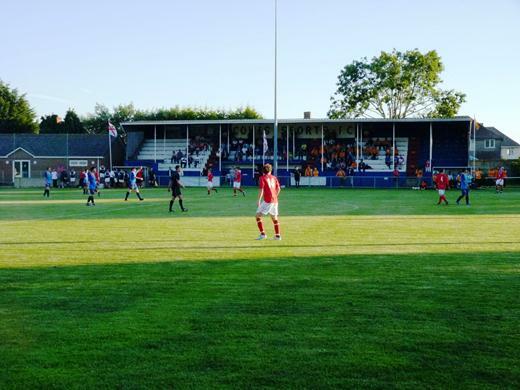 The support for other teams within your island is a feature of the Island games, but football benefits most from this, as the matches are relatively short, and of course the timing is known, as opposed to sports that just book the venue for the morning. Still, in helping out one group by changing a fixture, the organisers antagonised others who thought they knew the location and kick off of the match. Future organisers should consider setting the dates and venues, and allocating matches to them later  this will mean that one can be certain of a match by just turning up, while services such as the internet and twitter could inform people of the actual fixtures. Within the multi-sport environment, football does tend to grab the headlines, plus more than its fair share of resources. I remember my first trip to China, and skipping through some of the sports pages of old copies of the English Language China Daily. There was an editorial commending the Chinese on a record number of medals at the Asian games, held in Beijing earlier that year. But, the editorial added, the average Chinese citizen would swap them all for just taking the Football Gold. There is enough dissent in the Islands game circuit, that football could miss out on some future games. This would not be the end of football at the games, other sports miss out from time to time, (there were no gymnastics on the Isle of Wight for example, but seven of the Islands instead held a gymnastics competition in Jersey soon after the games finished). Football could miss a games, and then return for the next one. In the meantime, and as a possible prelude to an amicable divorce, with a football competition separate from the games, it has been announced that a four team tournament will be held next summer in Gibraltar. Jersey, Guernsey and the Isle of Man will take up the challenge. This new competition will be called the “International Challenge Shield”, and the organisers hope some of the other islands will join later. I have been asked a few times to produce a Changes List for this close season. This is the first draft, and will be updated with matters of fact, plus a few missing leagues. You are currently browsing the Football Shaped blog archives for July, 2011.